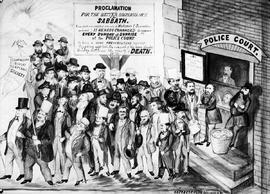 "Compulsory Sunday Temperance Society, Victoria, 1873." "Dolce far niente in the BC Legislature." "Government of British Columbia, 1897"; Edgar Dewdney's cabinet. "Premier McBride Presents Mr. R.H. Pooley, the Government Candidate, to the Electors of Esquimalt." 13th Parliament, Third Session, Victoria. 14th Parliament, First Session Victoria. 14th Parliament, First Session, Victoria; March 1 To August 17. 14th Parliament, First Session; First Liberal Legislature, Victoria. 15th Parliament, First Session, Victoria; February 28 To April 2. 15th Parliament, First Session, Victoria; February To April. 17th Parliament, 3rd Session, Victoria; February 11 To April 1. 17th Parliament, 5th Session, Victoria; February 23 To April 7. Another exciting day at the legislature in Victoria. Armadale; former residence of Senator William John MacDonald; 241 Niagara Street, Victoria. 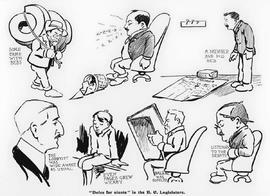 B. C. Legislators, Oliver Cabinet, 1918-1927, Victoria.